In the fourth act, the pace picks up. Scenes become shorter, shifting swiftly as the elaborate chess game of dark motives begets its misbegotten offspring. Laertes returns from France to avenge his father’s death. Shakespeare once again creates a doubling, with the hot blood of Laertes serving as a foil for the brooding, contemplative nature of Hamlet. CLAUDIUS: And where th’ offense is, let the great axe fall. He’s referring to the justification for Hamlet’s approaching doom. But by the same logic, he condemns himself to die! Wheels within wheels. No wonder then that Ophelia loses her mind in all of this — and ultimately her life as well. She is drowning — too fair, too innocent a creature to sustain the body blows of both father and lover felled — a lover who in fact has killed her father — plus a brother who will avenge that double loss in kind. 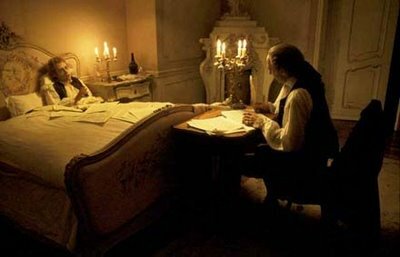 Mozart ought to conserve his energies, but the music (and Salieri) won’t let him go. While Salieri can barely keep up with dictation, Mozart dazzles him with a doubling, a trebling, a quadruppling of instruments. I feel a lot like Salieri hearing Shakespeare weave motif after motif into a crescendo of meaning and implication. Reading him is like playing chess against Kasparov, only not in two dimensions but three. Linguistically, thematically, dramatically, sexually, sarcastically, charismatically — genius refracted in all directions as a beam of light in a hall of mirrors or waves fractally crashing on a beach. Not just any beach but the North Shore — where the ocean exhalts in a display of raw power and beauty expended as brutal, primal energy. When I finished the third act I felt spent, my mind rent, my body in rubble on the floor. This fourth act, it upsets me, but not in the same way. I keep screaming “No!” like at a horror film: don’t open that door. Repent! Repent!!! The actions of men are what drive the sadness and tragedy. Can’t we change them if we wish? This, in dramatic form, is a restatment of Socrates’ famous line that the unexamined life is not worth living. Only here we see the implications of not thinking: our natures succomb to our basest impulses. We allow our greed to determine our actions. We sleep with scoundrels for a bit of safety and protection. We allow passions and hungers to guide us, and not the stars of our loftiest hopes and dreams. We get caught up in revenge for crimes that needn’t have been commited in the first place. But such is man. Such is the bed we make for ourselves to lie in. And should we not have Horatio’s reasoned detachment, we wither in Ophelia’s weakness by virtue of our innocence. The kindest words such a girl like that, in such a day and age, could ever hear are: get thee to a nunnery. It’s the only hope she has to survive! That, or awareness. But it is just such an awareness that scalds, that damns, that overwhelms her. I read with mouth agape as the king’s true intentions became clear. One act ago he was attempting to pray… but that was only a self-serving ploy to save his soul. Now, as his conscience comes awake, he can’t stand the scalding of its self-condemnation. Though it could be the burr to lead him to kneel, to submission and a true plea for forgiveness, it only spurs him to blot it out. Lacking the introspection and self-criticism of Hamlet, he can only turn the feelings outward to seek their cessation. In what? In more murder, of course. But not even by his own hand — let the English do it. Or Laertes. And not by a fair battle but by more conniving: Hamlet through his own integrity won’t check the swords. Give him a blunted one. Laertes ups the ante by volunteering a fatal dose of poison to the tip. And should that fail, the king can top that with a tainted grog should Hamlet tire in the duel and request a drink. You get the feeling these scoundrels could do this sort of thing all day. Foulness is their specialty. Machiavellian strategies are not the exception but the norm. For men like this, even the sanctuary of church is fair grounds to commit an execution. Doesteovsky said that without God, everything is possible. But in Shakespeare, God is right here among us, and the devil in the details. Yet men procede to damn their own souls and foul the human nest acting on their base impulses anyway! This entry was posted on 2010/01/08 at 12:27 am and is filed under Hamlet. You can follow any responses to this entry through the RSS 2.0 feed. You can leave a response, or trackback from your own site. I think I have some inkling of what you mean when you compare to Salieri. My heart broke for him, he wanted to make great music and for all his passion and yearning he had to bow before Mozart’s callow youth. Salieri appreciated Mozart’s genius and he coveted and resented it. He was helpless in his adequacy. I feel that way about Shakespeare although I’m not even at the adequacy level. But it would certainly be good to give the world something wonderful. Maybe it’s a good thing that we don’t know much about Will’s personal life. He was a door between the worlds that blew open and flooded us with clarity for the human condition. *A door between the worlds that blew open. *What a great line that is! Maybe Shakespeare is rubbing off on you too, eh?